I love this time of year when the Asarums need tidying; they are generally a quiet, evergreen groundcover for a damp, shady spot, just getting on with their job, and doing it well, but they really repay a closer inspection. 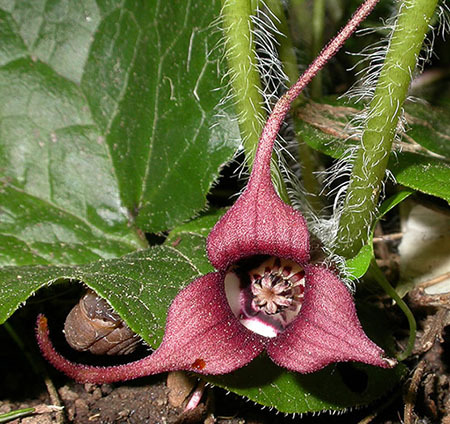 The Asarum family, found in North America, China and Europe, are known as Wild Ginger, a very apt name for when the plants are handled they produce a beautiful scent as if you’ve just stumbled into some expensive spa resort, or are sinking into an exotic scented bath (instead of getting chilly fingers and an aching back). Asarum caudatum, the Western Ginger, has lovely heart-shaped, slightly fleshy leaves, resembling cyclamen, which form a dense and elegant mat. But peek down around and under the leaves to see the strange and slightly sinister looking maroon and white bell-shaped flowers with three long petals that twist outwards into points (cauda is Latin for tail). The flowers stay on the plant for ages, low down and inconspicuous, eventually darkening and losing their long petals to become a cup. The late, great, plantsman E A Bowles from Myddleton House in Enfield was unkind enough to say that the flowers were ‘so uncanny and evil-looking that they would make a suitable buttonhole for the Devil’. Asarums have been grown in Britain for over a thousand years to very little acclaim except for use as a ginger substitute. Even that arbiter of Victorian wild garden style, William Robinson, when writing in 1883, said that they were of ‘little value except as curiosities, and occasionally as wood or shrubbery plants in ordinary garden soil’. This Western Ginger, which originated in western North America is however, unlike most of the Asarums as it is quite slug-resistant (and seemingly deer-resistant, although I haven’t been able to verify that since I live in a town). Interestingly, it has formed a symbiotic relationship with ants who disperse its seeds. The plant produces an oil on an appendage to its seed which the ant is drawn to. The ants then drag the seed back to their nest where the oil is stripped to feed the young, and the still viable seed is discarded. But if you have no ants, rest assured for the plant will also spread by its fleshy rhizomes. Asarum caudatum is a very underrated plant; a pleasure for the gardener to tend, the designer to use for beautiful ground-cover, and the owner to rootle around for those crazy, alien-looking flowers to create the perfect, if unusual, buttonhole.